A man arrested for robbing a Virginia Beach bank after he filmed himself in the act and posted it to Instagram, said he shouldn't have been charged because he asked nicely for the money. "A robbery is demanding, going in and demanding something...I didn't do that." 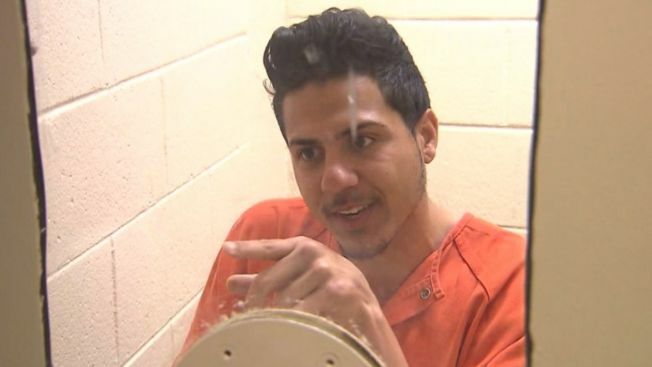 Dominyk Antonio Alfonseca, 23, said in a jail interview with NBC affiliate WAVY. "I asked actually politely." Alfonseca walked into a TowneBank, handed the bank teller a note asking for $150,000, then posted the video of the theft to his Instagram account, police said. In the cell phone video, the teller pulls out stacks of cash onto the counter and stuffs them in a bag. The note, which he also posted to the social media site, had a smiley face and said "please." It asked the teller to wait until he's gone before she hits the alarm, since the police take "3 to 4 minutes to get here." The Instagram posts have since been deleted from Alfonseca's account, but can be viewed in the video above. Alfonseca was arrested 20 minutes after he left the bank, WAVY reported. Police said he was found with a gym bag full of money.